Kwanzaa (KWAH-nzah) is unique. Though it is celebrated by millions of people annually, there continues to be curiosity about exactly what it is. It is a relatively new addition to the holiday calendar, and as holidays go, it's not religious, political, or heroic. It is a celebration of culture, community, and family. The holiday was created more than 30 years ago by Dr. Maulana (Ron) Karenga of California State University. The goal in creating the holiday was to recognize the culture of African-Americans and create a link with African peoples and tradition. Celebrated for seven days, December 26 through January 1, Kwanzaa is based on seven principles. Each day one of the principles is the focus of the holiday activity. The daily ritual begins with the lighting of one of the seven Kwanzaa candles by a family member or friend and a discussion of the principle the candle represents. Umoja [oo-MOH-JAH] (Unity) To strive for and maintain unity within the family, community, nation, and race. Kujichagulia [koo-ji-chah-goo-LEE-ah] (Self-determination) To define ourselves, name ourselves, create for ourselves and speak for ourselves instead of being defined, named, created for and spoken for by others. Ujima [oo-JEE-mah] (Collective work and responsibility) To build and maintain our community together, and to make our sisters' and brothers' problems our problems, and to solve them together. Ujamma [oo-jah-MAH] (Cooperative economics) To build and maintain our own stores, shops and other businesses, and to profit from them together. Nia [NEE-ah] (Purpose) To make our collective vocation the building and developing of our communities in order to restore our people to their traditional greatness. Kuumba [koo-OO-mbah] (Creativity) To do always as much as we can, in whatever way we can, in order to leave our community more beautiful and beneficial than we inherited it. Imani [ee-MAH-nee] (Faith) To believe with all our heart in our people, parents, our teachers, our leaders and in the righteousness and victory of our struggle. 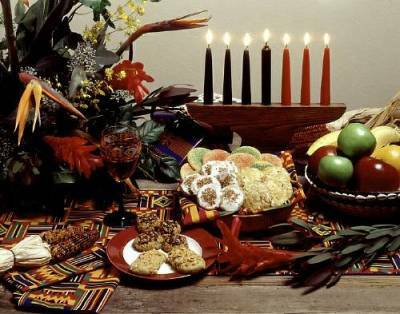 Growing interest in personal heritage and ethnic roots have contributed to the growing popularity of Kwanzaa. Though unique, it shares with other holidays the communal spirit and a cornucopia of food. In fact, food is an integral apart of the observance. Kwanzaa is derived from the Swahili word Kwanza which means 'first' or 'first fruits of the harvest." The holiday culminates with a feast or karamu (kah-RAH-moo) on January 1st. During the seven days preceding the feast, the menu may include foodstuffs native to the African Diaspora - peanuts, okra, yams, and black-eyed peas. The feast, served the final day of the celebration can be planned as potluck with each family member or guest bringing a favorite dish, or by a single host or hostess. The karamu menu can include favorite recipes and traditional foods from Africa, the Caribbean, and South America representing unity - linking lands populated at one time by African slave labor. The following menu suggestions include a variety of dishes for a plentiful feast. Peanuts are popular in numerous recipes and snacks and are known as groundnuts in Africa. Originally transported to this country as victuals for slaves, the peanut was cultivated in the South as an alternative crop for cotton. Groundnut Turkey Stew relies on peanut butter for the roasted nut flavor, and this dish is reminiscent of West African cuisine. Peanuts or groundnuts are good sources of protein, B-vitamins, and folic acid. Barbados Pork Roast is flavored with spices native to many of the Caribbean islands. Though pork has long been part of the African-American diet, the pork was most often smoked and cooked with vegetables to provide flavor and a small portion of meat when most African-Americans could not afford fresh cuts of meat. Today, lean fresh pork is rich in nutrients and lower in fat and cholesterol than pork of ten years ago. Hoppin' John and Jollof Rice are hearty and flavorful recipes that can serve as side-dishes or entrees. Hoppin' John is a Southern staple. The black-eyed peas along with peanuts were also transported from Africa, and rice was one of the key crops knowledgeable Africans in the South. Hoppin' John is traditionally served for the new year - according to the myth, eating peas New Year's day will bring good luck throughout the year. Jollof Rice is based on the traditional dish served in several countries in Africa. This dish, flavored with onions, peppers, tomatoes, and ham brings to mind an image of gifted Creole cooks. Mixed Greens - including collard, mustard, kale, or turnip - are cook's choice in putting the combination together. Though a menu staple in African American homes, greens served for the New Year's meal promise prosperity all year long. Contrary to popular belief, monetary rewards have not been proven but these vegetables are rich in vitamins A and C, calcium, and fiber. To round out the menu on this feast of plenty, call on the family baker to supply corn bread and desserts. Easily prepared in advance, Sweet Potato Pie and Pound Cake are dessert favorites and natural additions to the karamu menu. Sweet potatoes in fact trace tuberous roots to African yams, considered a staple and celebrated for sustenance and its importance as a crop in some regions of Africa. All of these foods are significant elements of our cultural heritage linking African peoples in many countries via common ingredients and preparation methods. Through food, creativity, and mother wit, our African ancestors were able to survive in new lands, pairing cultural traditions with unfamiliar experiences, creating new dishes and cultural observances. Kwanzaa celebrates this culture and creativity! Mazao (mah-ZAH-oh)--Fruits and vegetables, which stand for the product of unified effort. Mkeka (mm-KEH-kah)--A straw place mat, which represents the reverence for tradition. Vibunzi (vi-bun-zi)--An ear of corn for each child in the family. Zawadi (zah-WAH-dee)--Simple gifts, preferably related to education or to things African or African-influenced. Kikombe cha umoja (kee-KOM-beh cha oo-MOH-jah)--A communal cup for the libation. Kinara (kee-NAH-rah)--A seven-branched candleholder, which symbolizes the continent and peoples of Africa.